Have you ever walked into a transformed car park and felt like you had teleported into an alternate universe? 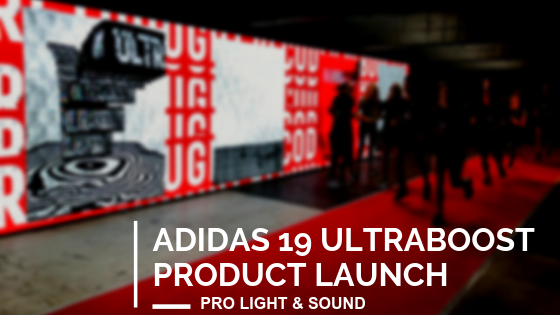 This is the experience that Pro Light & Sound were able to provide for the celebrities and industry influencers that were lucky enough to attend the latest Adidas product launch. Our brief from ID Collective was to emulate the European launch of the 2019 Ultraboost Adidas running shoe and take it to the next level. Because we are the experts in our field we were tasked with inspecting the undisclosed location and completely transforming it to accommodate such a brief. With only 4 weeks lead time to transform a car park into a custom designed and built wonderland fit for Adidas and some high profile celebrities and influencers, we were under the pump. To make this an even greater challenge we were responsible for the power management and faced height restrictions that added extra complexity. Our AV Styling and Production expertise were put to the test with a request for custom designed and built tech pods, an indoor running track, the installation of a 12 meter LED screen and a fully immersive multimedia production. We love rising up to a challenge. With the brief in mind; stand out at the highest level we got down to creating what turned out to be the “one of the best branding activation ID Collective have done in years”. We designed and custom built fully fabricated tech pods to mount the screens, storyboards and images. We laid down a 130m indoor running track. Our creative team used deconstructed Adidas shoes and created lit up mood boards and we even modified sports lockers that lit up with LED lights when opened, creating a futuristic experience. Our multimedia production team custom turned 2, 3 and 5 second GIFs into a looping video in a vertical and horizontal format that were displayed on TVs in the tech pods. We also produced 4K definition content that was showing on a 12m screen with no loss of quality. Using a great backdrop, we were able to maximise the photo and video opportunities for celebrities and high-level influencers to “do their thing” and help launch the new Adidas shoe into the Australian market. If you are looking for an AV Styling and Production partner for your next product launch, marketing campaign or brand activation, look no further than Pro Light & Sound. We bring our experience from the entertainment industry to the event marketing industry and create unforgetable experience and remarkable events.